My husband, Bryan, had told me that Mum was losing weight before she was diagnosed with lung cancer as he’d been working in the country and had visited my parents’ farm nearby. Then Dad rang to say mum had been admitted for a gall-bladder operation due to her weight loss. And finally he phoned to say that the shadow seen on Mum’s lung during an x-ray was cancer. I can remember putting the phone down, turning to my husband saying: “It’s lung cancer” and then bursting into tears. I looked up everything I could find about cancer and found that Mum’s version, small cell lung cancer, was the hardest to treat. Mum’s doctor advised she have chemotherapy and radiation or she would be dead within 18 months. Mum had both and was dead within 18 months. But it certainly boosted the coffers of the oncologist and Big Pharma supplying the oncology drugs. The first time I saw my mother after her diagnosis I didn’t know what to do. We’d driven down to Busselton, in south-west Western Australia where my parents lived, and I just stood and stared at her after I’d climbed out of the car. Then she said: “Just hug me” and I thought I’d never let her go. She returned with us for her first chemotherapy treatment. She was scared and it was terrible leaving her alone in the hospital ward. But although she lost her hair, Mum never got really sick and seemed to respond positively to the treatment. The only time I saw her lose the plot was when she thought she’d had her final radiotherapy treatment and then found she had another session of radiotherapy to her brain. She seemed to give up after that. I remember suggesting nervously to Mum as I was driving her home after chemo that she might give up smoking. Both Mum and Dad had taken up smoking when they lived in London during the war years and the Blitz. Mum had narrowly avoided being killed by two bombs – one a doodle bug which hit Woolworths in Lewisham, London, during peak-hour shopping and which she missed because she slept in; and the second time was because she had been transferred to the Central Telephone Exchange in central London from the local telephone exchange in Lewisham a week before the bomb shelter with all her telephonist friends inside scored a direct hit by a bomb. All her friends were killed. When Mum came to Australia, she had to have regular, annual chest x-rays as the doctor told her they kept an eye on people migrating due to the stress and possible health problems. But he said he never ever advised anyone who had taken up smoking during the Blitz to stop smoking as he said it was pretty much impossible and he’d never had any success. When I made the comment about packing in smoking, my mother replied bitterly: “Everything else has been taken from me. I’m not having my cigarettes taken away.” It was the only time she came close to admitting that she hated Australia. We – Bryan and I – were both aware that she had not settled in this new country. Mum had left her own mother, sister, brother, nephews and friends behind in the UK. She was a sociable woman had had loved working at the jewellery and wig counters in Debenham’s in Canterbury. But in Western Australia, Dad bought an isolated farm in the south-west where the house was ramshackle and they had to travel a long distance to get any groceries. Mum told me later that she’d finally told Dad she’d divorce him unless he sold the farm. They did move into Busselton but again into a run-down home where Dad proceeded to make a complete shambles with all the rubbish he collected. Finally they bought a house in Rockingham so Mum could be nearer medical treatment. And it was here that Mum finally died. We had a dreadful time when she was in Sir Charles Gardner Hospital in Perth. One night the phone rang around 1am and it was the hospital advising that mum had been admitted as an emergency. We rushed over to the hospital to find Mum blue in the face and her heartbeat up to 160/minute. She was fighting for breath and it turned out that the tumour which had disappeared in her lung after chemotherapy and radiotherapy had spread to her larynx and was choking her to death. It was only the fact she had a strong heart that prevented her dying then and there. Mum was taken in for laser surgery to clear out the tumour temporarily and she looked right as rain when I next saw her which was quite amazing given her condition in the middle of the night. 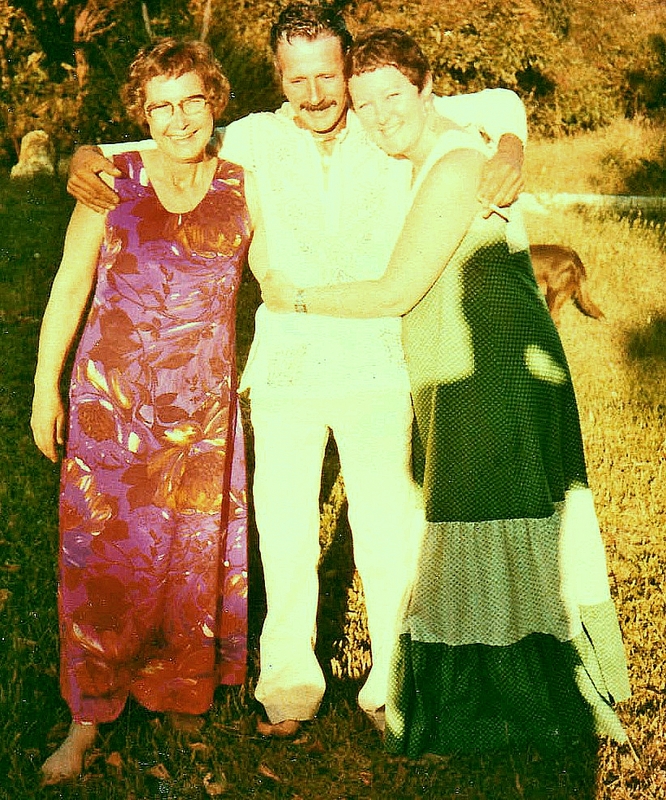 Me, my Mum and my husband, Bryan – taken a long time before she got sick. But then I was out in the corridor talking to a young doctor when he casually told me my mother was now terminal and would die within a few weeks. We were standing among lots of people and I remember staring at him in disbelief. Mum had appeared to be reacting well to the medical treatment and no-one had even mentioned that she had a limited life span. To this day I can’t believe that someone could be so cold and insensitive. I know when we first went in to see this miserable specimen of humanity after Mum’s lung cancer had been diagnosed that he started going through Mum’s test results and got to a point where he mentioned the lung cancer may have metastised in her liver, which frightened the life out of both of us. Then he broke off to answer a phone call, had a nice chatty session with a fellow physician, while we were left hanging in the air, unsure how bad the news really was. Finally he put the phone down and said: “But a closer inspection shows that’s not the case”. Personally I could have ripped the guy’s head off, but my Mum was very respectful of and intimidated by the medical profession so I stayed quiet in order not to upset her. It was this same ratbag who so casually talked about sedating Mum until her death and not one skerrick of compassion crossed his lips. Years down the track I found a poem I wrote about him, where I expresssed my rage and fury at his cold-heartedness and I must admit, I laughed me head off, it was a very healing experience for me. Unfortunately it’s far too libellous to reprint here! Dad and I walked out of the specialist’s office and stared at each other. We both agreed that we had wanted to reach over the desk, grab the specialist’s tie and strangle him for his utter insensitivity. Dad said then that he would take Mum home and make sure she died in her own surroundings rather than be left in a hospital which had so little regard for her dignity and well-being. We were also pretty sure that the hospital was giving mum some drugs which were causing her to hallucinate, as she was doing really odd things in the hospital, like dropping pins into the water glass of her neighbour who was in the two-bed ward. Naturally enough, the neighbour wasn’t too impressed. We know they offered mum an experimental drug which she accepted as she was desperate not to die. But of course, she was dying so the medicos where quite happy to use an experimental drug on her as if she was a guinea pig to be used and discarded when she died. We then we found out that one night she’d gone running around the hospital demanding the drug. The nurses’ reaction was quite unsympathetic, just annoyance at the interruption to their routine, and no sympathy for a very sick woman scared stiff of dying. We mentioned the use of the experimental drug to one of the nurses who said: “Have they told you or her of the side effects? ” When we said “No – what side effects?” she looked disgusted and said we should have been told. And as it happened it was supposed to come from America and never arrived. When Dad got Mum home, he said the first night she got out of bed, got a chair and sat in the corner of the room, staring into the corner. When Dad asked my mother what she was doing, she said the doctor had told her to act this way. Dad told her the doctor had informed him that it was now okay to return to bed which she did. And after that, as whatever drugs my mother was being given in the hospital wore off, she returned to normal although her health continued to deteriorate. 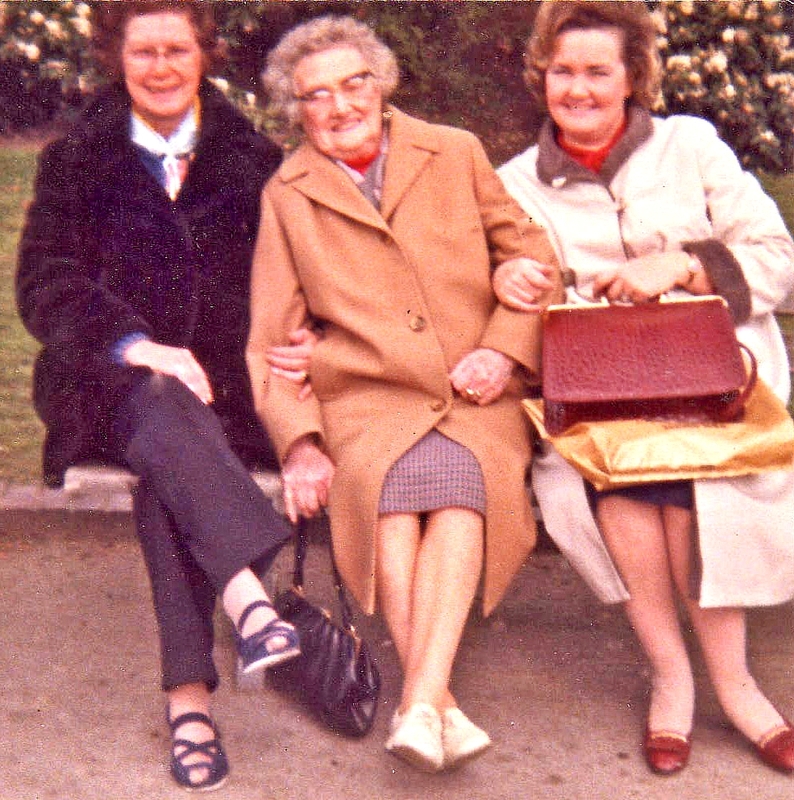 Mum, Nanna & my Auntie Muriel (mum’s sister) when Mum went back for a holiday to the UK. What was hard about mum dying was that she never admitted her condition was terminal. The only time she came close to alluding to her death was when she turned to me shortly before she died and said: “You’ll write to my friends and tell them about, well, you know, won’t you?” which I did but none of them bothered replying. Dad nursed mum right through her last days with the support of the Silver Chain hospice care. She seemed bright and breezy on her birthday on the 19th September and again was bright when I visited on the morning of 21st. But in the afternoon Dad phoned and said she’d deteriorated rapidly and her death was imminent. I drove down to Rockingham and found Mum fighting for every breath. She would inhale and breathe out and each time we’d think it was the last breath. I was able to give her a cuddle but her torment was appalling. I know other relatives of cancer sufferers will say the same as me, that a lovely person like my mum didn’t deserve the awful death she suffered. It wasn’t until around 7.30 that the Silver Chain gave her some morphine to ease her pain, she fell asleep and then slipped into a coma. Finally, just after midnight, she took her final breath and was at last at peace. A huge storm was passing through Rockingham and Perth that night, but an angel from the Silver Chain braved the filthy weather, came out to us, washed mum’s body with my help, and we dressed her in a lovely dress she had adored. The funeral home came for her body just at dawn and it was when I saw her being wheeled away that I finally broke down and started crying. I remember being doubled up with grief and Dad saying: “Cry all you want, love. I wish I could do the same”. I cried all the way home and I guess didn’t stop until late in the evening. And with Mum’s death, the intermediary and peace-keeper between myself and my father had disappeared. I found that people didn’t want to talk about death and dying and losing your mother, and felt incredibly lonely and beside myself with grief and no-one to share it with. So I decided to see a psychologist and it was one of the best things I’ve done because not only could I talk about loss, the issues between myself and my father began to surface and I began to work on healing those issues.